The Dolomites Riding Center is your headquarters for exploring the region in terrific local loop rides among the peaks of the Dolomite Mountains, a part of the Italian Alps. 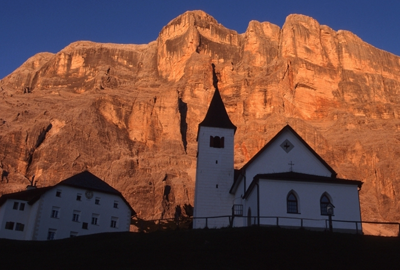 The Center is located at an exclusive spa and hotel in the heart of the Dolomites. There you will find all the tools you need to build your unforgettable holiday: great motorcycles, a perfect location, and an expert guide to suggest routes and offer any assistance that you might need. The Dolomites riding center will take you to ride over the best roads in the Alps. Imagine mountains in the shape of Gothic cathedrals and castles in ruins – immense walls, high towers, and even petrified thunderbolts. The mountains in the area are made of rocks that change color during different parts of the day. Colors change from sunrise to sunset – they could be white like snow, grey, yellow, pink, or red. It’s a spectacular show to just sit and watch, but imagine doing a motorbike tour on incred­ible twisty roads through such a show! You are free to ride with the guide and the other participants or to ride on your own, maybe setting up a meeting with the others during the day, or to simply relax at the spa in your hotel. The walks and excursions in the area are fantastic if you or your partner would like a break from riding. We are sure you will love the atmosphere, the freedom and the local hospitality at the Dolomite Riding Center. Morning meeting at Mototouring headquarters in Milan to pick up the bikes and ride to Canazei, the heart of the Dolomiti Region, about 300 kilometres away. Welcome briefing, dinner and overnight. Days 2 to 7 – Monday to Friday – Riding the Dolomites! Construct your own motorbike tour by joining our loop rides, guided by our tour leader, or explore the Dolomites on your own. You will ride in one of the most famous places in the world for motorcyclists. You will have a chance to experience the highest and most spectacular passes, like the Passo Gardena, Pordoi, Sella, Falzarego, and the highest and demanding, the Stelvio Pass! A detailed road book and a regional map will be delivered with the bike, should you decide to explore the area alone. After a relaxing sauna and a glass of the superb local wine, you can enjoy the regional specialties at dinner. After lunch ride back to Milan through wonderful back roads to drop off the bikes, farewell dinner and overnight in Milan. Free time until your flight time schedule. 7 nights in a 4 star hotel in Canazei with dinner and breakfast. Luggage transfer from Milan to Canazei and back.